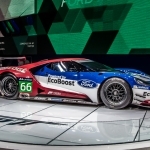 Ford debuted their all-new Ford GT to replace the aging current Ford GT supercar. 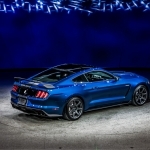 Opting to go with twin turbochargers in the new GT, instead of the supercharged V8 in the original, Ford packs the most powerful EcoBoost engine ever under the hood. They are not releasing any specific performance figures but we are told it will deliver more than 600 horsepower to the rear wheels. 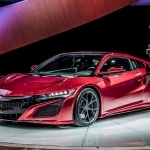 The engine will be paired with a seven-speed DCT transmission. 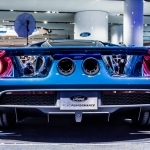 Really, the Ford GT needs no introduction. In fact during the unveil, Ford saved all the fanfare for the GT350R and just let the GT do all the talking. 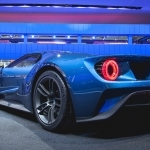 While the new Ford GT is wide up front, the lines of the body taper inwards creating a narrower cabin to aid in reducing aerodynamic drag while directing airflow to the mid-mounted engine. An active rear wing that adjusts its height and angle based on speed and driver input further control the air flow to balance maximum aero efficiency and handling. It rides on a set of 20″ wheels wrapped with Michelin Pilot Super Sport Cup 2 tires that cover a set of carbon-ceramic brakes on all four corners. Swinging the doors upwards reveals the two seats that are integrated right into the carbon fiber passenger cell. If you want to feel the road, you can’t get any more connected! Instead of gauges, the cluster is fully digital and is driver configurable similar to Audi’s virtual cockpit. I for one can’t wait for more details, and look forward to more performance info from Ford. Until then, whet your appetite on our gallery of the new Ford GT!